One of the surest ways to start the day off in a good mood—other than a strong cup of coffee, obviously—is picking an outfit that can stand up to your commute. If you've ever teetered your way down subway stairs in a pair of too-high heels or struggled to power walk in a pencil skirt, you know what I mean. Fortunately, there's a solution: gaucho pants. 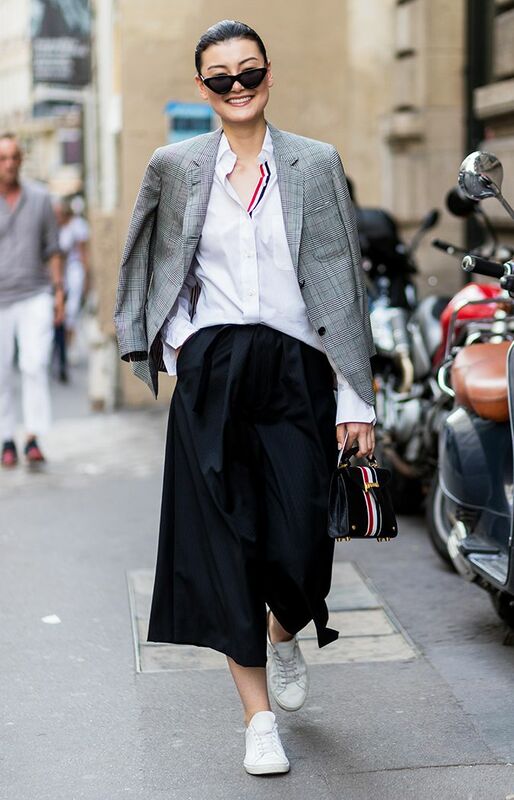 Styling the cropped, wide-leg pants with sneakers makes them thoroughly subway-friendly, while swapping those out for some high heels makes them suitable for the office. Either way, they look polished and not overdone—and better yet, they're super comfy. Gauchos also happen to be an excellent all-weather style, despite what you might think considering the length. Wear them with ankle-hugging booties (which happen to be trending this fall) to show off your footwear during the colder months. Read on to see four tips for styling the trend, and shop 13 pairs to wear for your commute and beyond. A blazer and button-down don't have to look corporate—just add sneakers and loose-fitting, low-waist pants. This all-white outfit looks cool, not clinical, with the addition of some cherry-red pumps. This billowing wide-leg style is balanced out by ladylike slingbacks and a fitted tee. A pajama-style set looks put-together with a structured handbag and walkable mules. Slim-fitting through the hips and wide through the leg, this silhouette is extra flattering. When you want to wear florals but aren't quite in the mood for a dress, these are your answer. The all-too-rare combo of comfy and dressy. Corduroy is coming back, and we are here for it. Perfect for summer with a striped linen top. For all your urban-safari needs. How to wear millennial pink to work in one easy step. This color can be worn all year round—try a white tee now and a turtleneck come fall. A cool, casual alternative to jeans for the weekend. These work equally well with polished pumps or sneakers. This utility style would be so cute with a cropped white lace top. As relaxed as can be yet super chic with a crisp white button-down. Up next, read about the trick to finding out about Zara sales before everyone else does.